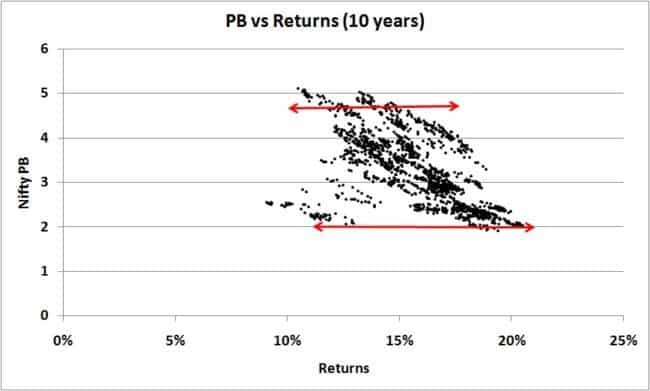 Is PB-based investing better than PE-based investing? In an interview to Wealthforumezine, Shankaran Naren, CIO, ICICI Pru AMC, suggested that buying low and selling high using the price to book value (PB) is better than the price to earnings (PE) model. Since I have earlier shown that there is absolutely no merit for long term investors to buy at low PE and sell at high PE, I wanted to check if using PB would make any difference. PB is easier to understand than PE. PB is simply the market price divided by the price mentioned in the balance sheet. High PB represents overvaluation. Low PB represents undervaluation and makes senses only if other metrics are healthy. PE is the market price divided by the earnings per share. (1) In the interview, ( http://goo.gl/B449cr ), Naren made it clear that buying low and selling high is merely a tactic to help those who were scared of equity markets and is not a strategy to get more returns. This is definitely commendable. (2) Naren said three of their funds, ICICI dynamic, ICICI balanced and ICICI Equity income use the PB model. The first two funds have been using it since 2010. (*) Dumb question: Is earnings per share also not a balance sheet item? Even if not explicitly mentioned, can it not be easily calculated? How is PB more reliable? (5) While I am only looking at the index PB value, the fund management will have several other considerations. So this is neither an attempt to prove or disprove Naren’s statements. I did this only to satisfy my curiosity based on his statement about PB model being better than PE model, and to find out if that applies to the Nifty. First let us look at Nifty PE vs. 10-year Nifty returns. This is from the previously published analysis. Notice the spread in returns corresponding to low Nifty PE. 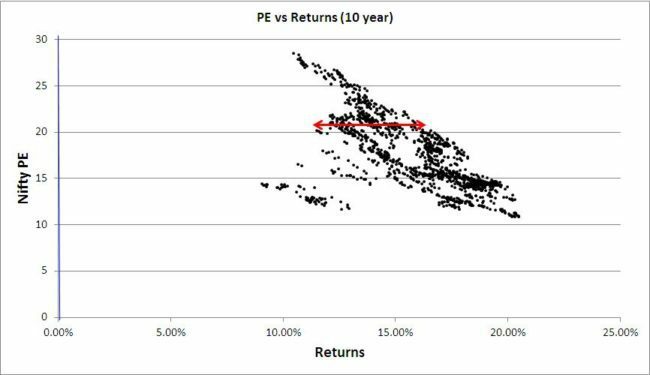 In fact, had you invested at a PE of about 12, your 10-year return could be anything between 10% to about 20%. You would have got similar returns have you invested at a PE of 20-22 or even more! Which is why I am convinced, Nifty PE and current market levels are irrelevant for the long term investor. The main reason why I write this post is because I see no reason why PB-based investing should be any different. Notice that while higher PE implies higher PB, there is a huge spread involved. A PE of 22 could mean a PB 3.8 or 5.8. So a ‘sell-call’ based on PE need not correspond to a ‘sell-call’ based on PB. Similarly a PB of 3.8 corresponds to a PE of anything between 14 to 22! Although the range of PE variation is greater than that of PB, prima facie I do not see any great benefit in using Niftu PB instead of Nifty PE. Have is a look at Nifty PB vs. 10-year Nifty returns. Again to the long-term investor, the PB value on the date of purchase is practically irrelevant. “ICICI Prudential Balanced Advantage Fund and ICICI Prudential Dynamic Plan are being run on P/BV Model since 2010. This has helped the funds to consistently outperform their benchmark index and deliver reasonable alpha over the last five years. Perhaps the volatility has been low because of rebalancing based on the PB model. However, I think the alpha is primarily from good stock selection based on a much wider set of metrics. To answer your question: earnings is an income statement item and book value is a balance sheet item. (In India income statement is also called profit and loss statement, etc). The reason most people say book value is easier to calculate is because earnings can be ‘massaged’ to look better. There are so many factors that affect earnings and since earnings is given so much weight by analysts management has a perverse incentive to always make the earnings number look good. One example is changing the accounting method to reduce depreciation for instance. In the PB vs PE plots, I see some clearly correlated data subsets, which are represented by straight lines – each with a similar, but progressively increasing slope as the PB range edges to the higher side. Are my eyes deceiving me or are those real? Any idea what those subsets represent? Disparate data sources perhaps? 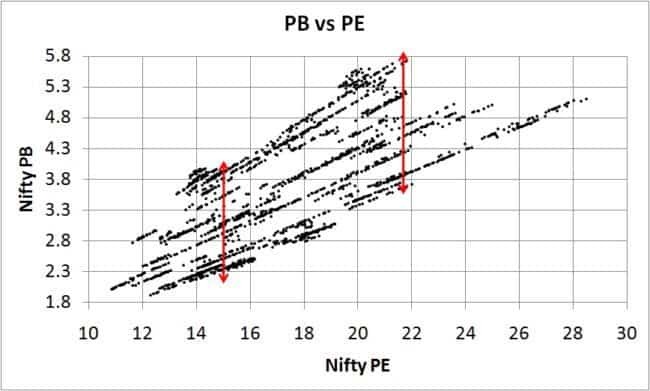 For every single day, if there is a single PE and PB value for the nifty, a scatter plot should not show such correlations, No? It is a PB vs PE plot on the same days. There are correlated subsets, yes. Where the next subset will fall, cannot be foretold. Hence this correlation is not of much use.